“Tale of a Lake”, produced by Marko Rohr, will have its World Premiere at the 2017 WCFF in New York, NY this October. The full length Wildlife Conservation Film Festival is October 14-24 in New York, celebrating its six year anniversary with ten days of film screenings, panel discussion, field trips, receptions, biodiversity conference and an awards ceremony. For more information visit:WCFF.org. The WCFF is the first and only film festival on the planet whose mission is to inform, engage and inspire the protection of global biodiversity. We frequently hear about warming ocean temperatures, waste pollution, and habitat loss in marine environments, but little attention is given to another large issue affecting marine life: noise pollution. Noise pollution is beginning to show a major physical and behavioral affect on marine species ranging from whales, sea turtles, and sea birds to carbs, shrimp, and invertebrates. The pollution is mainly coming from the explosive sounds made by cargo ships, sonar guns, and air guns used by the U.S. Navy and during gas exploration. One species in particular, the Blue Whale, is drawing more attention to the issue because of how they’re affected by the noises. Noise pollution can be harmful in multiple ways. Species of whales and dolphins rely heavily on sounds while communicating with each other, hunting prey, escaping predators, and finding mates. The loud noises made during human activity can mask the sounds made by the marine organism, causing it to become lost or separated from its family, or interrupting its role in the food web. Noise pollution can also physically harm marine organisms depending on the size of the vibrations caused by the sound. The National Oceanic and Atmospheric Administration (NOAA) has attempted to eliminate this issue on a case-by-case basis, preventing the use of the sonar guns or cargo ships when an organism is present in the nearby distance to the source of the noise. NOAA has now spent 6 years drawing an Ocean Noise Strategy Roadmap to deal with noise pollution and bring more attention to this issue. Not only are endangered species being watched closely, but also the entire effect from noise pollution is being researched to determine how whole marine environments are being altered. Source: Goldman, Laura. “A Plan to Mute Ocean Noise for Marine Life.” Environmental News Network. 15 June 2016. 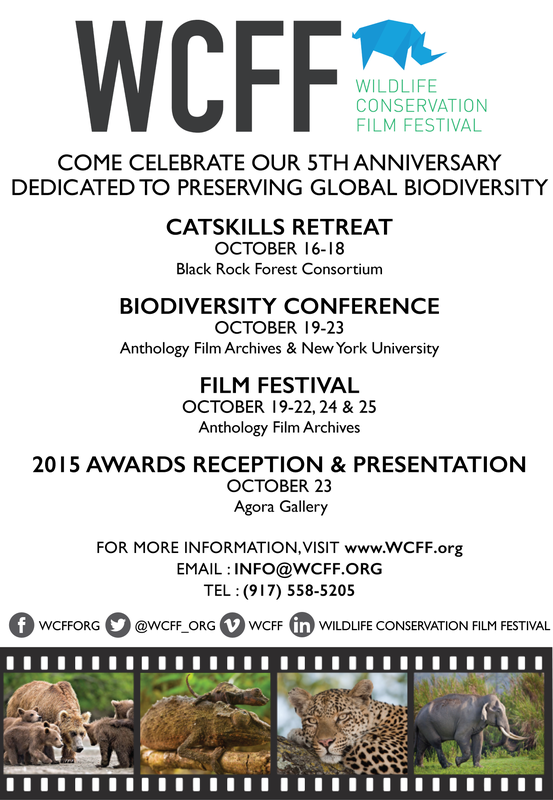 New York, NY (March 28, 2016) – Wildlife Conservation Film Festival (WCFF) today announced that DDB New York will serve as its pro bono agency of record, effective immediately. WCFF is an organization that creates public awareness programs that inform, engage and inspire audiences about the need for and importance of global biodiversity protection. In this new agency relationship, DDB New York will be responsible for WCFF’s creative campaigns to increase understanding of WCFF as an organization, as well as encourage attendance to WCFF’s flagship event in New York City, October 2016. WCFF’s premiere event features the finest independent films from around the world, which cover topics across natural history and conservation of biodiversity. In addition, the organization promotes programs throughout the year that contribute to the protection of biodiversity and sustainability to facilitate the realizations of inspiration as committed action to ensure that biodiversity will be permanently protected on a global scale. “The work that Christopher has been doing with WCFF is so important and we are humbled by the opportunity to help WCFF expand and reach bigger audiences,” said Icaro Doria, Chief Creative Officer of DDB New York. DDB New York launched its partnership this month with WCFF’s rebranding, including a new logo, as well as social presence. The next ad campaign is slated to break in April 2016 and is focused on raising awareness of deforestation’s impact on endangered species and on promoting wildlife procreation. The Wildlife Conservation Film Festival (WCFF) produces signature events to showcase the finest independent films from around the world, which cover topics across the fields of natural history and the conservation of biodiversity. The Festival’s films connect the dots between saving species from extinction and preserving the Earth’s precious resources of food, water and clean air. The WCFF is the first organization of its kind to present an issue that has widespread public support in a powerful visual forum, showing how wildlife preservation impacts our day-to-day lives. Founded in 2010, the Festival attracts international audiences of all ages. It is a must-attend event for thought leaders in biodiversity, film and major conservation organizations, providing a unique setting to interact directly with conservation experts and filmmakers, often via one-on-one conversation. advertising publications and has been recognized by top awards shows including Effie, Cannes, CLIOs, The One Show, New York Festival and more. The agency’s U.S. clients include McDonald’s, Unilever, Mars, Johnson & Johnson, Qualcomm, Capital One and State Farm, among others. Founded in 1949, the agency is part of DDB Worldwide and consists of more than 200 offices in over 90 countries with its flagship office in New York, NY. Omnicom Group Inc. (NYSE-OMC) is a leading global marketing and corporate communications company. Omnicom’s branded networks and numerous specialty firms provide advertising, strategic media planning and buying, digital and interactive marketing, direct and promotional marketing, public relations and other specialty communications services to over 5,000 clients in more than 100 countries. For further information on Omnicom and its brands, please visit www.omnicomgroup.com. Today is World Rhino Day. Wildlife conservationists and concerned individuals alike are celebrating the large, horned herbivores by spreading awareness about the vulnerable species. World Rhino Day has grown into a global phenomenon to spread the word about both the beauty of rhinoceros and the dangers they are facing. Here are ten interesting facts about rhinos, as well as ways to contribute to World Rhino Day. 1. There are five species of rhino, which are indigenous to Africa and Asia: black, white, greater one-horned or Indian, Sumatran and Javan rhinos. World Rhino Day celebrates all five species. 2. Rhinos have been around for more than 50 million years. Some of the world’s first rhinos didn’t have horns and roamed through North America and Europe. But no known rhino species have ever inhabited the South American or Australian continents. 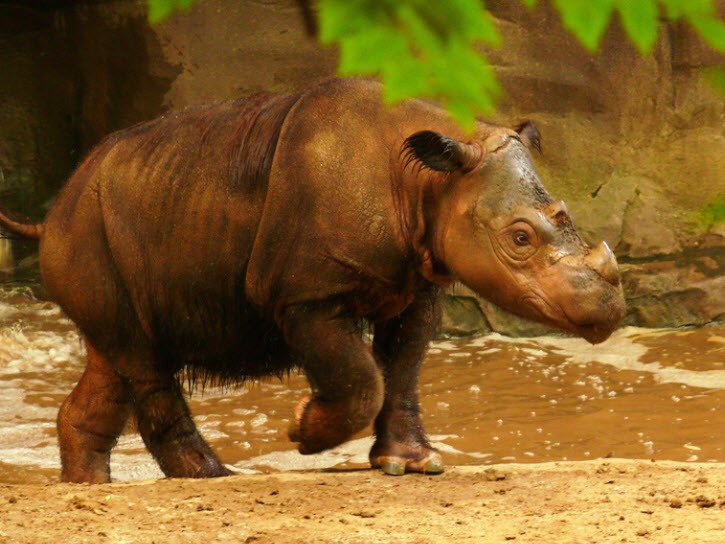 The Sumatran rhino is the closest living relative of the ancient woolly rhino. 4. Three of the rhino species are listed as “critically endangered” by the International Union for the Conservation of Nature (IUCN) Red List of Threatened Species, which means they have a 50 percent chance of becoming extinct in three generations. With its headquarters in the United Kingdom, the IUCN is the leading world’s authority on the conservation status of species. There are perhaps 95-125 Sumatran Rhinoceros left in the wild. 6. Rhinos can grow to over 6 feet tall and more than 11 feet long. The white rhino is the second largest land mammal after the elephant, with adult males weighing up to a massive 3.6 tons. Thanks to conservation efforts, this rhino species was brought back from the brink of extinction. 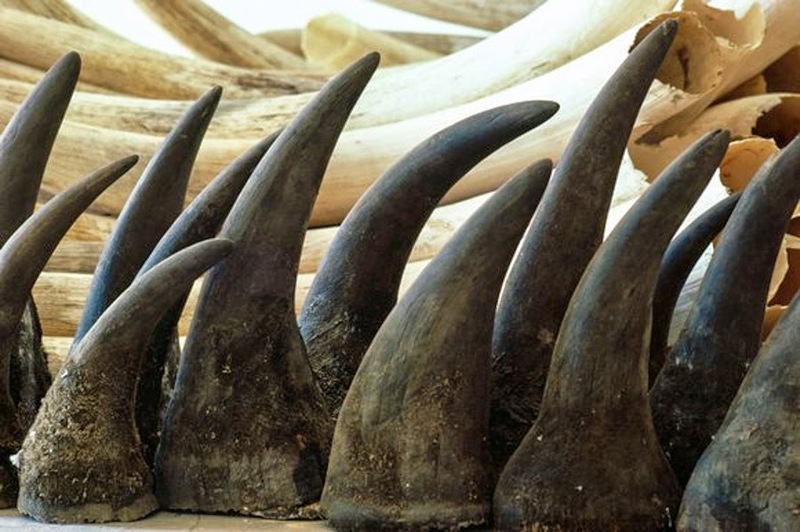 But a surge in poaching for their horns has seen a record number killed in recent years. There are 20,000 southern white rhinos living in protected areas and private game reserves, mostly in South Africa, and just four northern white rhinos living in captivity in Kenya and the United States. 7. The Javan rhino is the world’s rarest land mammal and less than 50 survive in Indonesia’s Ujong Kulon National Park, according to Save the Rhino. 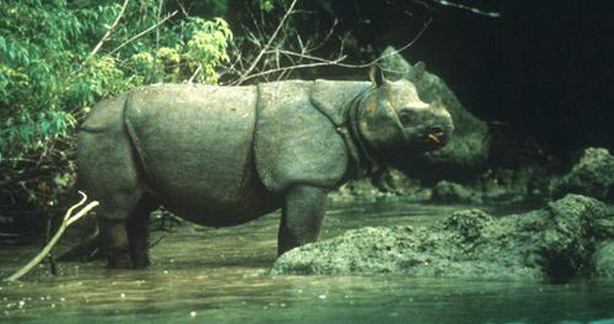 Perhaps as few as 50-60 Javan rhinoceros remain in the world. However recently three separate calves were seen via camera traps. This gives hope the species can be saved from extinction. 8. Rhinos have poor eyesight and have difficulty detecting someone only a hundred feet away. But they have a high sense of smell and well-developed hearing and can run up to 40 miles per hour. 9. 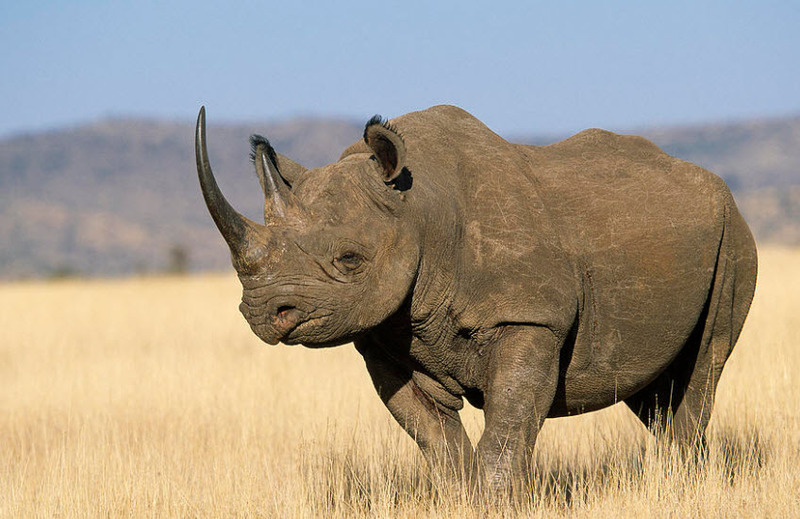 Rhinos have thick skin that can be very sensitive to sunburns and insect bites. The animals wallow in mud, which protects their skin from the sun and bites when it dries. The Wildlife Conservation Film Festival & Biodiversity Conference, October 16-25 in New York, NY will feature several speakers to discuss the conservation of rhino. Also will be the world premiere of HORN, produced by Dr. Reina-Marie Loader of the Cinema Humain and professor at the University of Vienna. 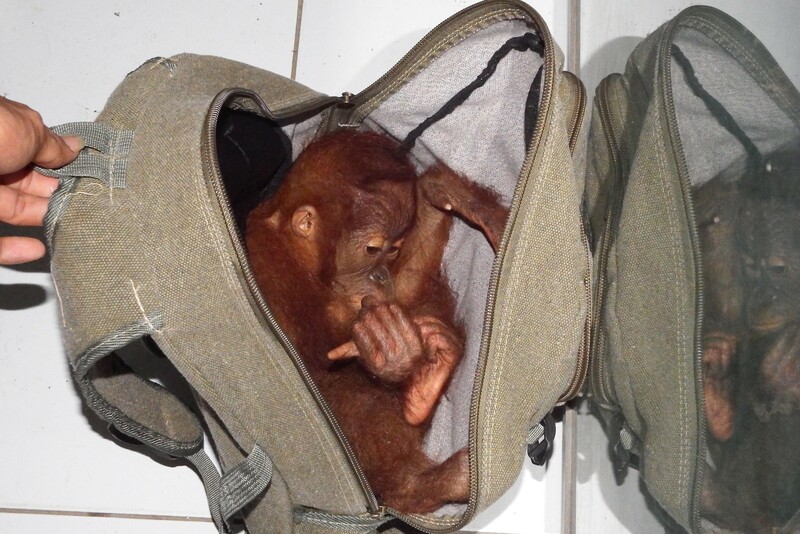 A prominent Indonesian wildlife trafficker who was arrested while trying to sell a baby orangutan was sentenced last week to two years behind bars and ordered to pay a Rp10 million ($752) fine. 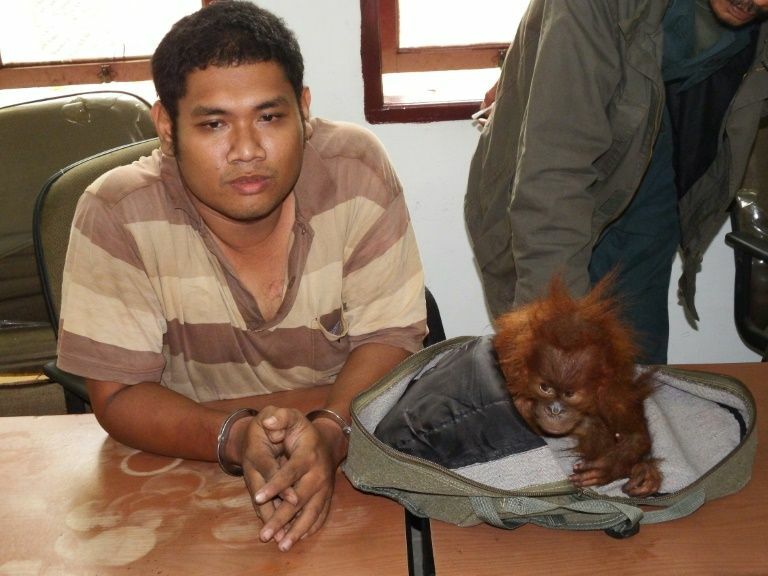 The trafficker, Vast Haris Nasution, admitted to running a trading network that stretches from Indonesia’s westernmost provinces of Aceh and North Sumatra, where he illegally sourced a variety of protected species and animal parts from local hunters and dealers, to Java in the center of the country. Besides the critically endangered Sumatran orangutan (Pongo abelii), Vast Haris sold golden cats, porcupines, slow loris, siamangs, gibbons, hornbills and baby crocodiles, as well animal parts like hornbill beaks and the skins, claws and canine teeth of Sumatran tigers (Panthera tigris sumatrae). His capture followed the arrest and conviction of one of his staff, Dedek Setiawan. In April last year, conservation authorities found Dedek in the North Sumatran city of Medan with two golden cats, a siamang and a gibbon. He had been using the Internet to connect with buyers. A few months later he was sentenced to 16 months in prison and fined Rp5 million. Indonesia is a hotbed of illegal wildlife trading, but traffickers often escape significant punishment, so the verdict constitutes a win for Indonesia’s biodiversity. It is hoped this firm decision from the judge and prosecution today will have a deterrent effect among the community, sending a clear message that wildlife crimes can and will be punished. Since the early 70s there have been over 3,000 confiscations of illegal pet orangutans in Sumatra and Borneo but only a handful of actual prosecutions, and all of them only in the last few years. Effective law enforcement and the threat of serious consequences for those involved is an essential component of the conservation arsenal if there is to be any hope of preventing the extinction of orangutans, and many other heavily traded and persecuted species here.